German physician; born at Filehne 1830; died in Berlin July 12, 1896. He studied at the Gymnasium zum Grauen Kloster, in Berlin, and later at the university of that city, obtaining his M.D. degree in 1855. The same year he went to Vienna and Prague to take a post-graduate course under Oppolzer, Skoda, Dittel, Schuh, and Hebra. 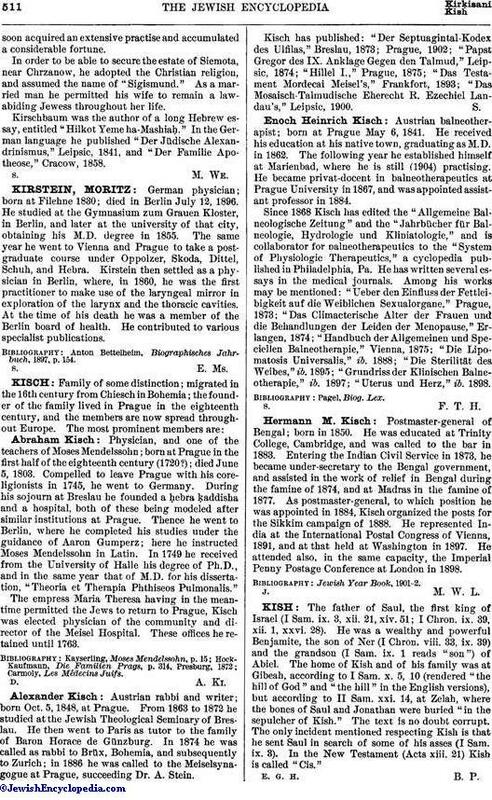 Kirstein then settled as a physician in Berlin, where, in 1860, he was the first practitioner to make use of the laryngeal mirror in exploration of the larynx and the thoracic cavities. At the time of his death he was a member of the Berlin board of health. He contributed to various specialist publications. Anton Bettelheim, Blographisches Jahrbuch, 1897, p. 154.